Read on below for a guest post from Assistant Professor Cynthia Gentile and Associate Professor Carol Sherman, as they share highlights from our recent LEX induction ceremony on behalf of the entire Paralegal Studies Program. We’re happy to report that our first Lambda Epsilon Chi (LEX) National Paralegal Honor Society induction ceremony was a huge success! We recently celebrated the achievements of our 73 inductees with an event on campus, followed by a virtual induction ceremony for those who were unable to attend in person. Another proud Peirce College tradition has begun! Recognizing the achievements of our students is so important, and it was great to see their pride and excitement, and learn about how Peirce College helped them achieve their career goals and transform their professional lives. This group of exceptional students and alumni has worked extremely hard to achieve this type of academic success, and we are proud to have them represent the Peirce College Paralegal Studies program. 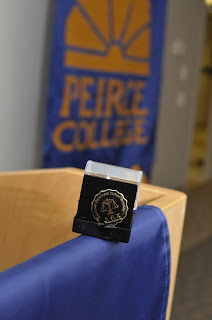 The receptions (both in-person and virtual) gave students and recent alumni the opportunity to network, reconnect, and share stories about how their professional lives have progressed since being a part of Paralegal Studies program at Peirce. Peirce College alumna Babette Pace ’06 spoke to the group about the importance of professional associations in the career arc of a paralegal, and how her experience at Peirce helped her become a confident professional with an active role in the Philadelphia Association of Paralegals (PAP). Jo-Ann Williams ’04, board member of the new Peirce Alumni Association, co-chair of its Career Committee, and member of our Paralegal Advisory Committee, also shared some insight about her Peirce experience and the importance of alumni engagement and maintaining connections throughout your professional journey. As the event neared its end, we surprised Dean Miller by announcing that he would be our chapter’s first Honorary Inductee. For the past 11 years, the Philadelphia paralegal community has benefited significantly from Ed’s work. 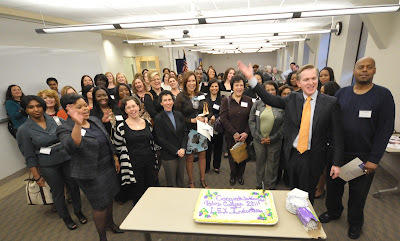 His commitment to the profession improves opportunities for not only our students, but paralegals everywhere. 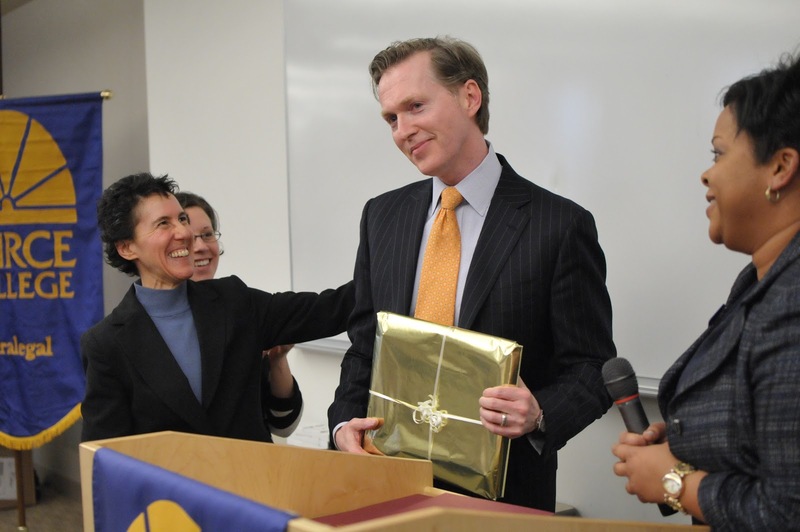 Thank you, Ed, for everything you do for the Peirce Paralegal Studies program, our students, and the profession! It takes so much to successfully organize and execute an event of this magnitude. We truly appreciate the exceptional support we received from every division of the Peirce College community, especially Dean of Students Rita Toliver-Roberts for her efforts in making this all come together. To President Mergiotti, Pat Rucker, Rosemary Connors, Beverly Elliott, Chuck Wright, Debbie Schrammel, and Jon Lenrow -- we can’t thank you all enough for your support and assistance along the way! View the slideshow below for more photos from the event.